Addressing operable partition acoustical considerations helps ensure the success of a flexible space. With facility needs evolving, the demand for easily reconfigurable spaces continues to increase. Operable partitions allow the temporary subdivision of large spaces into different configurations. If designing operable partitions into your project, keep the following recommendations in mind. A flexible event space with partitions. Choose with care! Often, functionally separated spaces require a degree of acoustical separation, too. Classrooms or meeting rooms can get by with a lower Sound Transmission Class (STC) rating. 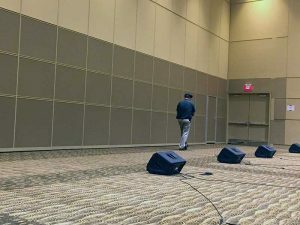 However, a partition between two ballrooms with low-frequency energy from a DJ or band sound system would need the highest STC ratings available. Look for a system with seals (manual or automatic) that are not engaged until the partition is in its final configuration. Sweep-type seals degrade over time because of friction (dragging across surfaces). A substantial track enclosure helps to keep sound from going over the partition. Isolated jambs and thresholds provide a surface for a positive seal. In addition, they prevent sound from going around the partition by traveling through the fixed walls or floor. 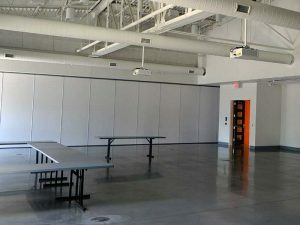 Sometimes the new spaces created by the operable partition will require sound absorption to prevent undesirable echoes or to control reverberation. Panels with a perforated face can offer integral absorption, but result in a lower STC rating. Sound-absorbing finishes may also be surface-mounted on the panels. However, this requires greater stacking depth for the panels. Testing partitions at Mayo Civic Center. Don’t just trust it will work as it should! Post-installation Noise Isolation Class (NIC) testing can confirm whether an installed partition performs as specified. This testing can point out potential weaknesses in construction to be corrected before the facility’s first use. Our consultants at AVANT ACOUSTICS keep up with the latest operable partition models available from major manufacturers. We can help you wade through all the information to specify an operable partition that is just right for your next project. We can even perform the post-installation testing. Give us a call! We are happy to help! Authored by AVANT ACOUSTICS Senior Associate, Emily Jaumard.